Aging is an undeniable natural phenomenon where you’re certain to become all grey-haired and wrinkly. But the situation isn’t entirely helpless. It is up to you whether to age gracefully or incapacitated by ailing body and aging disorders. As Eleanor Roosevelt puts it, “Beautiful young people are accidents of nature, but beautiful old people are works of art”. By changing your habits, you can step elegantly into aging. 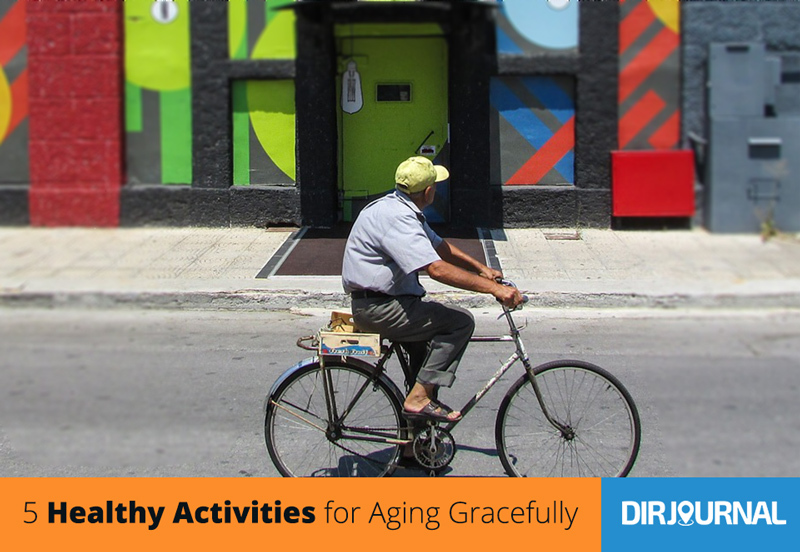 Proceed to learn 5 new activities for elderly to age charmingly. Fitness is the key to a healthy body and mind. Stretching exercises improve body flexibility and provide strength to perform different cardiovascular activities, so that you steer clear from chronic diseases. Your body tends to become shaky and lose balance as you grow old. Add balance exercises to your daily routine like Tai chi, yoga, water exercises or walk on a challenging surface to reduce body imbalance. Also, make a habit of doing neck exercises. It keeps the brain cells active and maintains head balance. Physical activities tend to reduce the risk of dementia (mental illness), therefore walking and jogging should be a part of your daily routine. Dancing is also a happy exercise. It strengthens the cerebral activity that aids in better memory. The right amount of lean protein can improve your muscle activity. However, avoid taking it excessively otherwise you run the risk of trapping yourself in cancer and heart diseases. Taking red meat twice a week is adequate. Commercially produced meat can be a health hazard, so it is better to use vegetarian proteins (beans, lentils and other legumes), which can be consumed up to three to five meals per week. With aging, the taste buds weaken, leading to the desire of adding more flavors and salt. High salt level in your diet can result in high blood pressure. Blood pressure tends to increase with age causing strokes and inability to perform cognitive functions. Being overweight can limit your flexibility and mobility. Curb the carbs and sugars to stay free of cholesterol and diabetes. Use natural sugars like fruits and beets instead. Intake fruits and vegetables in their raw form, because they lose their enrichment (vitamins, iron and calcium etc) once cooked. Stop using canned and processed foods; they are injurious for your health. Opt for fresh foods. To maintain good health, you should know the difference between healthy and unhealthy fats. Unsaturated fats like vegetable oils (olive oil, canola oil, grape seed oil etc) and nuts that are high in vitamin E should be preferred over saturated fats (solid fats) like margarines. Fats whatsoever should be used in less quantity to maintain a healthy weight. Omega-3 fatty acids, present in fish and nuts, are a great source of reducing brain inflammation. The regular use would bring a youthful glow on your face. Seniors often get exhausted by noon especially after the lunch. This indicates that your body lacks proper nutrition. Fresh foods are slow in restoring the nutrients your body requires, so it’s better to use the supplements instead. Start taking supplements only after consulting with your health specialist. Consume high-antioxidant foods like prune (dried plum) and drink lots of water to revitalize your body. Take preventive measures to remain fit and healthy. Get yearly flu shots, chest examinations, screenings and x-rays to thwart any attack. Keeping an eye initially on disease indicators that usually happen at an old age can create a lot of difference in terms of the degree of disability people experience in later life.